I haven't posted anything on this blog for a couple of weeks, due to lots of academic activities and personal matters. But here is a lovely letter I received today, which I thought I'd post in case my readers would enjoy it. I'm particularly happy to see a typewriter lover who's inspired to spread the love. On another note, I invited Christian humanist Alan Jacobs to speak at Xavier, and this afternoon we had a mutual pleasant surprise. I found out that he follows this blog (hi, Alan)—and he had not realized that I was its author! Huge fan of Alan! And now realizing his work fits perfectly into the ethos of the Typosphere. I think our direct association began when I bought a typewriter pad from you several years ago. I quite literally use it every day. I love my typewriter pad, too. 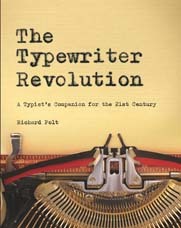 I still cannot believe I used a typewriter for all those years (approx 1970-1988) without one. Viva! I wonder how many other prevalent people follow your blog! Probably several!